Imagine going on that road trip with family and friends, enjoying your favorite meals while behind the wheel of a brand-new SUV. This can now be a reality with Jollibee’s Scratch2Win promo! 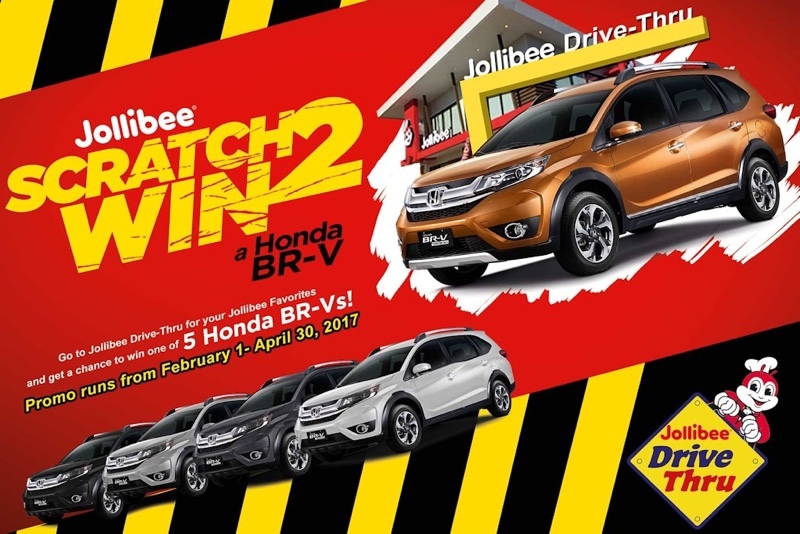 Jollibee Drive-Thru customers are in for a pleasant surprise as they get a chance to win their favorite langhap-sarap treats and drive home a brand new Honda BR-V. Starting this February until April 30, the country’s largest fast food chain is bringing a little more joy on the road by treating Drive-Thru customers to an exciting pool of prizes. With a minimum P200 single receipt purchase, customers will be given a scratch card where they can win Jollibee favorites like Yum Burger, Jolly Spaghetti, Peach Mango Pie, free drink upgrades, or one of five brand new Honda BR-V SUVs! grabe! totoo pala tlga yan noh?! sayang wala kami drive thru dito! bukid pa kasi eh....that's a very great news sa mga nagnangarap tlga mgka honda! !